Cosby sweaters are generally the least cool thing you could possibly wear, but it turns out that there’s at least one that we wouldn’t mind wearing. This literal Cosby sweater was made by Andrew Salamone on a hacked knitting machine from the 1980s. Instead of knitting the usual stripes or bizarre abstract patterns knitting machines are known for, this one acts sort of like a printer that uses yarn instead of ink. Salamone demonstrated his awesome invention at the World Maker Faire New York 2011, where he showed off some of his incredible creations. 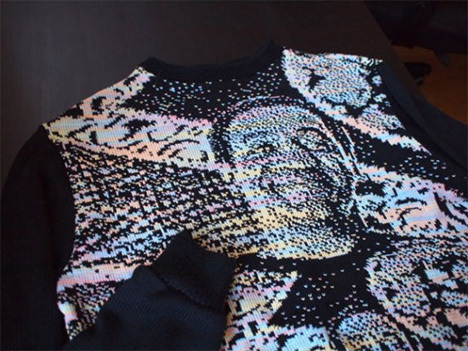 They included a ski mask with an image of his face on the front, a scarf imprinted with a famous break beat and the amazing sweater featuring a picture of Bill Cosby wearing a sweater featuring a picture of Bill Cosby. Salamone mentioned that he made the sweater for Mr. Cosby himself, but no word yet on whether Bill is actually wearing the trippy creation. See more in Do It Yourself or under Technology. October, 2011.